Foglyn is an Eclipse plugin which allows you to create, view, edit, assign, resolve or close your FogBugz cases directly from your favorite IDE. 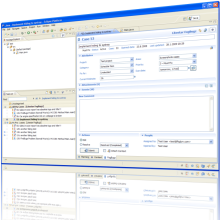 Foglyn works with Mylyn, task-focused interface for Eclipse. Mylyn helps you to focus on one task while hiding everything else what is not relevant to this task. Foglyn integrates FogBugz cases into Mylyn and enables it to track context (i.e. files) related to your assigned tasks. Foglyn allows you to see all your cases from FogBugz in Eclipse Task List. You can view and edit your case, attach new files or screenshots to it, resolve it or reassign to somebody else. Foglyn supports editing cases in offline mode — your edits can be submitted later, when you are online! Foglyn works with any FogBugz 6, FogBugz 7 or FogBugz 8 installation, including FogBugz on Demand. Foglyn works inside Eclipse 3.4 (Ganymede) or later, including latest Indigo release. See screenshots for more details about supported features. Download page contains requirements and download instructions. Foglyn 1.7: bug fixes and open-sourced. Foglyn 1.6.2 release fixes FogBugz 8 compatibility bug.